Set in 1920's Hollywood, silent movie and matinee screen idol George Valentin has a fateful chance encounter with aspiring actress Peppy Miller. Times are changing in Hollywood with the arrival of Talkies and while George struggles with his colossal pride in the face of obsoletion, Peppy is catapulted into the limelight. While I fully understand the praise and adoration being lavished on this French nod to 1920s & 30s Hollywood I can’t say I agree with it entirely. It’s a great movie, beautiful even and in a time of shoot ‘em up/ blow ‘em up/ kidnap ‘em and beam ‘em ups, it boasts a gimmick that no one of recent years has been brave enough to use. Silence. Well, beautiful music and sound play, even a title card or two but minimal words and dialogue. It could be that I only got to see this The Artist after it had been hyped out of the stratosphere, there’s probably nothing more annoying, but this is certainly not a mainstream film. Judging by the three couples walking out during our showing, I'm not alone in that belief. If you know that going in though, The Artist is a breath of fresh air. The story is engaging and simple to follow. There’s humour, heart and real artistry at play. Even in black & white the 1920's fashion is breathtaking. It boasts several nods to the silent films of yesteryear and a funny reveal at the end. Actually I laughed more at Peppy trying to drive than anything else; it reminded me so much of my driving skills in LA Noire last year. Dangerous. 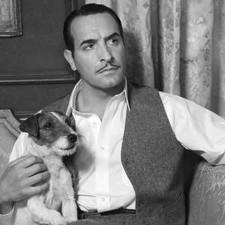 The acting is outstanding from everyone, especially Uggie the dog, he’s hilarious and steals the show several times. This is Uggie's 'Oh no you dih'int' face. The one thing I noticed more than anything else, however, was how distracting the sound of the cinema is while this movie was playing. Munching, crunching and whispers, you just don’t get that with a Michael Bay production. I jest. On the whole this is a wonderful film, beautifully executed and well worth your time and money. I expect it will do brilliantly come award season, I can’t see that it deserves to sweep the boards as predicated but it will definitely be up there. Given the choice I would have preferred to see it from the comfort of my own couch with a roaring fire and a bucket of popcorn. 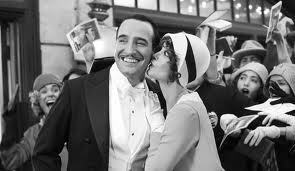 At least then I could shout at the childer to be quiet but if you're looking for sheer escapism in a movie this weekend then off you jolly well pop to see The Artist. I really want to see this film but I think I'll wait for the DVD. Dying to see this - hopefully with no annoying chatterboxes in the cinema! I do think it's worth experiencing with everyone, though - when else would you get the chance to see a silent film at the cinema?! Been waiting to see if you would review this, and what you would have to say about it. I do believe that in the days of silent cinema it was actually customary for people to talk all the way through films since they didn't particularly have anything to listen out for! It was only when speech was ushered in that it became frowned upon to make any kind of noise in the cinema. Anyway, great film, really puts you in a good mood.